Now in easy to open sealed Bulk Pack. 3 Blades...specifically positioned to extend gradually closer to your beard, to shave you progressively closer in a single stroke. So close there is less need to reshave, which means less irritation. Patented DLC (tm) comfort edges...each blade has a patented DLC comfort edge, so Mach3 glides effortlessly and comfortably across your face. 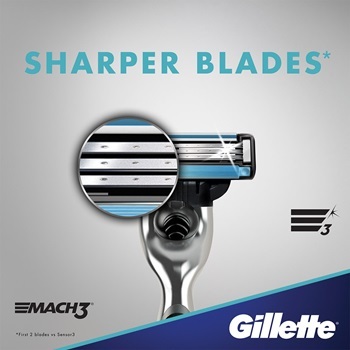 And Mach3 has an advanced Indicator lubricating strip with a blue stripe that fades away when you are no longer getting the optimal MACH3 shaving experience. All Mach3 cartridges fit all Mach3, Turbo, Power, Venus, Devine handles. Cartridges vacuum sealed for your convenience. Excellent product, great value and fast shipping. I haven't bought a razor blade anywhere else since the first time I ordered from greatrazors in August of 2007. I am and will continue to be a regular customer. My order history: Aug 29, 2007: Ordered a 4-pack of Mach3 cartridges just to see if the claims were true after reading a good review at http://www.headshaver.org/log/index.php?itemid=19 Dec 28, 2007: I ordered an 8-pack of Mach3 cartridges because the last of the 4-pack was finally getting a bit dull. The claims are definitely true. Aug 19, 2008: I ordered a 12-pack of Mach3 cartridges because I had just put the last cartridge on my razor handle and didn't want to run out. Sept 03, 2008: The last blade from the old pack will probably last another week or so before I have to toss it and open the new 12-pack. In the meantime, it's still giving a good shave. That's an average of a cartridge per month - incredible! The secret to making these blades last as long as possible is to rinse them in cold water. Hot water damages and warps the delicate blades. I found this out when I forgot to rinse with cold water and my blade's edge suffered noticeably from one shave to the next, which is unusual for these cryo'd blades. Even the cryogenically-hardened metal of the blades cryo'd by greatrazors is subject to warping and cracking under heat stress. If your blade clogs, rinse more often, or swish it in a cup of cold water. Your blade and your wallet will thank you.